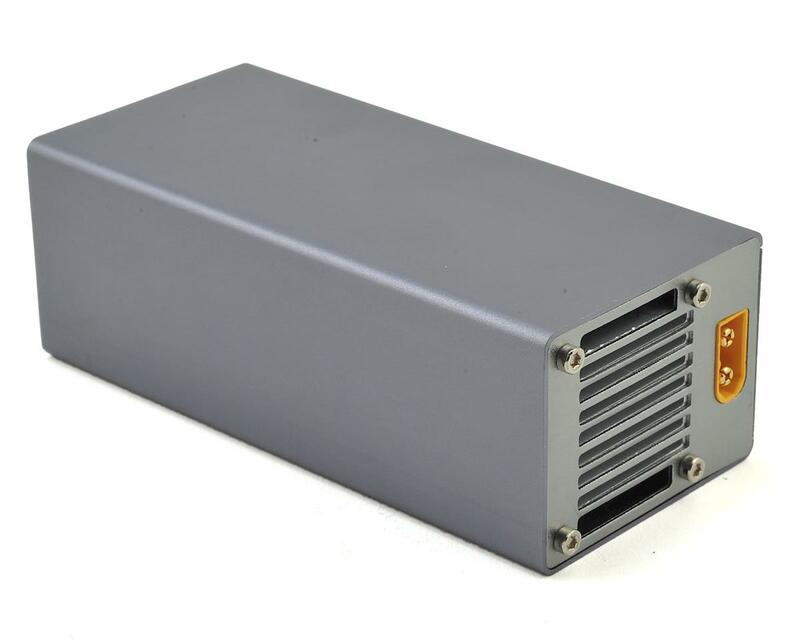 The iSDT FD-100 Discharge is a sleek and compact discharging solution for LiPo batteries ranging from 2s to 8s. Simplistic functionality allows for quick and easy set up for various batteries and discharging need. By selecting the proper number of cells, the discharger will ensure that the voltage is within proper range before automatically discharging. Based on wattage and voltage, the maximum discharge amperage will vary. As the voltage decreases, the discharge will slowly ramp up the amperage of discharge based on the selection at the time the discharge process has initiated. In order to always discharge at the highest rate, you can simply leave your selections at 6A. Programmed from the factory, the FD-100 is set to discharge the batteries down to 3.8V per cell. 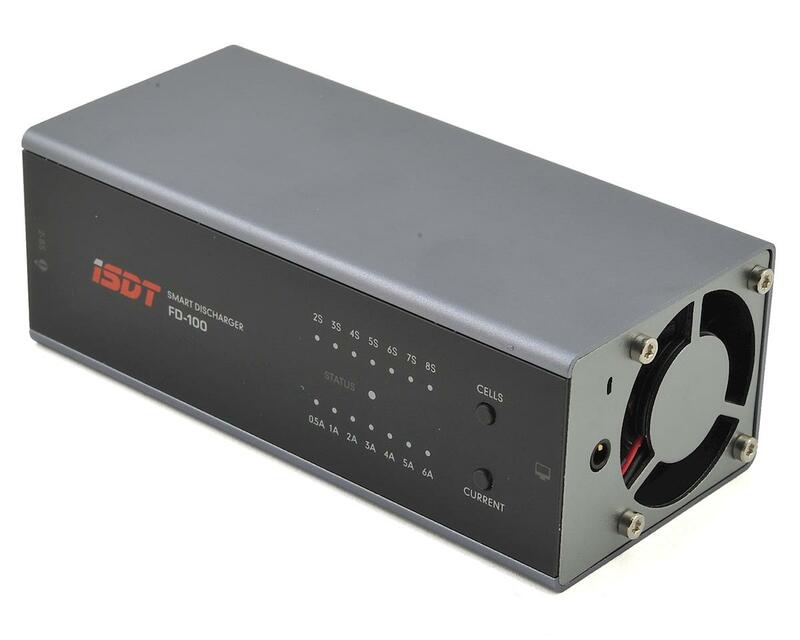 However, when connected to the iSDT SC-Linker (ISD-USB), the cut off voltage can be adjusted via PC software or with a compatible iSDT charger. This is a great discharger that makes getting fully charged, or partially charged lipo packs into storage voltage, as easy as pie! The wattage is capped atound 80 watts, which far eclipses most chargers. This is enough to discharge most cells in a reasonable amount of time, with little to no interaction from you. Why no more wattage? It's $36 bucks! There is a ton of value built into this device. The control software is available now, and i was able to successfully program two of these units usimg the Linker and my Windows 10 laptop. At this price, there is no better way to discharge. I have used this a few times so far and for 36 bucks it is really handy. My Reedy 1216C charger will only discharge a 4S battery at 0.6A which takes forever. Now it does 6A and works relatively fast and easy. The only beefs I have are it didn't say anything about needing a cable (it's not included) so I had to buy a XT60 connector adapter (I use XT90, so it was XT60 to XT90). Also, it doesn't balance the packs so you might need to balance it towards the end, but it is nice if you have packs you fully charged at a race and didn't use and need to discharge them quickly so they don't degrade by leaving at full charge. Although it is used only several times it has broken. 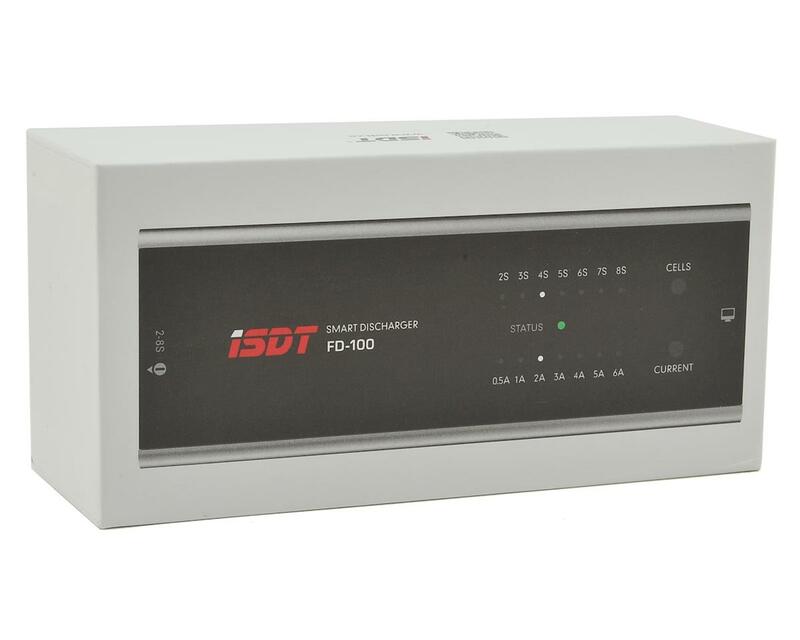 You must request the software for the FD100 to ISDT to change the cut-off voltage. You need a iSDT SC-Linker. The ISDT T8 isn't compatible (no option in the last firmware)!! Why the choice of the number of cells is not automatic? Why only 6A on 2S? It's good discharger, you don't need a power supply.